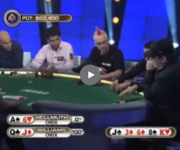 Can Phil get Shaun Deeb to fold? We hope you learn some new tricks from this hand, because you’re gonna need them at the tables! Click here to play free poker app.